I had a lot of baby spinach to use up, so I searched through my “recipes to try” file and saw this recipe for Baked Couscous and Spinach. It sounded perfect, and it was. I used tomato flavored couscous, which is why the couscous is so orange. I used baby spinach and tore it up a little bit. I didn’t have pine nuts, but it was good without them. This can be a vegetarian main dish or a side dish for a non-vegetarian meal. We had this with baked lemon garlic tilapia for dinner (a simple but delicious recipe), and I had it as a vegetarian lunch another day. I found this recipe on Food from Books, but the link is broken and I can’t find it on the site. I’m glad I copied the recipe instead of just saving the link! So I bring you my version, below. Combine the couscous, boiling water and salt in a large bowl; cover with a plate Let sit for five minutes, then fluff with a fork. Preheat the oven to 375º. Heat the olive oil in a large skillet over medium heat. Saute the onion for 10 minutes, or until tender. Add the garlic and sauté for another 30 seconds or so. Add the drained tomatoes (and dried basil, if using) and cook for 10 minutes more, until jammy, stirring frequently. (If you have time, let this mixture cool a little.) Stir the tomato mixture into the couscous and mix in the reserved tomato juice, (fresh basil, if using), pine nuts, raw spinach and pepper. Spread half the couscous mixture into a shallow baking dish (I used a 9×13 pan sprayed with non- spray; a smaller pan would work too). Sprinkle on the cheese, then cover with the remaining couscous. Cover the dish with foil and bake for 25 minutes, or until hot and bubbly. The entire dish can be assembled up to 24 hours in advance. Sounds good, Jill! Definitely a good way to use up spinach. Yum! This does look delicious and Dave and I are both huge spinach lovers! I love the colors in this! It’s so pretty!!! Sounds like it would go beautifully with Tilapia! Sounds like a great side dish! Every time I eat couscous I wonder why I don’t make it more often, it’s so good. Oh, this looks wonderful, Jill. I am stealing this one. The colors alone will cheer up a cold winter evening, don’t you think? 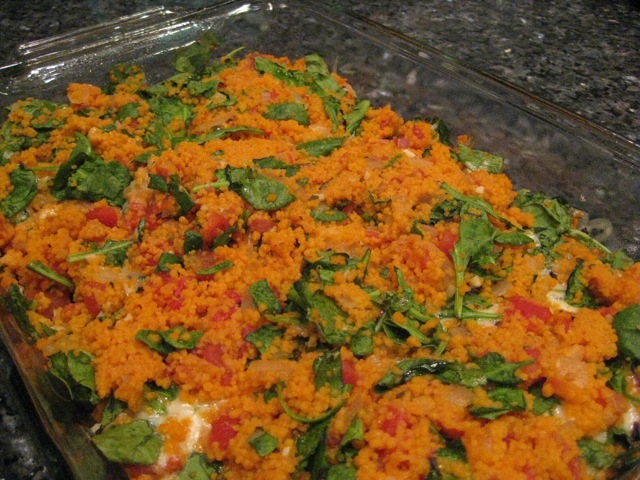 I’ll have to search for tomato flavored couscous and make this! It’s great with plain couscous too – really, I don’t think the tomato couscous tastes much different!